Why Aren't You Solving Ohno's Problem? Why Aren’t You Solving Ohno’s Problem? The Lean Enterprise Institute’s Lean Transformation Framework encompasses five questions. The first question is: “What problem are we trying to solve?” For most people, it is a reasonable first question to ask. But there are two other important related questions: 1. Who should answer that first question? and 2. Is there a common answer? In LEIs Lean Transformation Framework, it seems that everyone should answer that first question and that there is no common answer for organizations. The question is open-ended and so too will be the answer depending on who answers it; anyone from CEO to shop floor associate. The context, Lean transformation, reflects changes in mindset and practices across an entire organization. Given the scope of change, the first question can only be answered by the executive team. After all, Lean, we are now told, is a strategy, and so executives are clearly responsible for answering this first question for an organization. Given what concerns CEOs, the answer will surely be specific and connected to actual business needs. One such need that all businesses have, and which all CEOs care about, is cost reduction. So, the question “What problem are we trying to solve?” can yield a common answer both within a business or for any business: cost reduction. There are many methods to achieve cost reduction. However, executives should seek methods that strengthen competitiveness, not weaken it. Strengthening competitiveness means finding methods to reduce costs when production volumes are low. Simply increasing production quantities to reduce costs (i.e. economies of scale), which anyone can do, weakens competitiveness in buyers’ markets. While the first question must cascade through the organization, so too must its answer in order to focus team and individual problem-solving efforts. If not, then people will be busy solving problems for which there is no actual business need. This is called “busy work,” which we have all experienced. If employees continue the same old pattern of doing “busy work” while under LEI’s Lean Transformation Framework, then people will work to solve problems that have no business need and produce no business result. And there will be no Lean transformation. Most businesses operate in competitive (buyers’) markets. Daily competition and the existence of other threats to survival means a business cannot afford to solve problems disconnected from actual needs and which have no business impact. It wastes time and resources, and will put them further and further behind the competition as time goes by. It also wastes people’s (employees’) lives. The logic that drove Toyota’s transformation process. Should your logic be any different? LEIs Lean Transformation Framework says that you should take a “situational approach.” It says every situation unique and every countermeasure unique. It that true? In reality, your business environment, your problem, and your customers’ desires are the same as what Toyota faced in the late 1940s and still faces in 2017. Therefore, you need to figure out how to reduce costs while producing small numbers of many types of products. How will you do that? You must change from batch-and-queue to flow, and transform all other parts of the business to support that. A situational approach? For most businesses, that is nonsense. But it is not just changes in processes throughout the company. It is also changes in mindset for both management and workers. The change in mindset – what Ohno called “a revolution in consciousness” (p. 14) – is especially difficult for managers because it encompasses numerous economic, social, political, and historical factors that serve as powerful bulwarks against changes in thinking (as well as recognizing simple realities such as buyers’ markets). This is why most Lean transformations fail, notwithstanding the ubiquity of Lean “busy work” and the lack of business results. The change in manager’s mindset has proven to be the greatest challenge over the course of the 125-year history of progressive management. For example, when Ohno said “cut costs,” the conventional-mindset manager, whether in 1917 or 2017, immediately jumps to the idea of reducing headcount through layoffs. Hence, people today widely associate Lean with layoffs. But, Ohno never meant layoffs. He meant cutting costs in ways that did not harm people. In fact, he wanted people to benefit from the challenge and experience of participating in cost-cutting. How? By developing human capabilities; using their creativity and resourcefulness through hands-on and brain-on engagement in what he called “rationalization.” What Ohno meant by “rationalization” was “kaizen” – Toyota’s industrial engineering-based kaizen methods – to improve processes and the work, thereby improving productivity and cutting costs, while simultaneously satisfying customers and generating profit. This is why Taiichi Ohno stressed “the equally important respect for humanity” (p. xiii) in efforts to create and sustain the transformation. For every business that operates in a competitive environment – which is most businesses, whether for-profit or not-for-profit – the problem you are trying to solve today is virtually the same problem that Ohno and his team worked to solve over a 30-year period beginning in 1947. The situation is the same. The countermeasure is the same. And the process is the same. 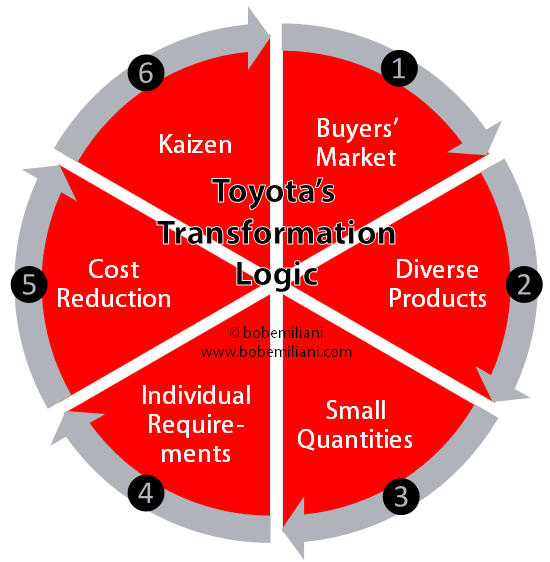 But, given that there are large differences between Lean transformation and Toyota transformation, you must make a choice: Lean transformation (ambiguous and open-ended, devoid of kaizen and other important umami), or Toyota transformation. Choose the former and you will increase the risk of losing ground to competitors. Choose the latter and not only will you work towards solving Ohno’s problem, you will instill organizational commitment and discipline to customer satisfaction. * If you rely solely on budgets and spreadsheets as your indicators of costs, then you will never understand TPS. When Ohno says “costs,” he is referring to anything that directly or indirectly creates or reduces cost, whether it is measurable or not, and whether it is visible or not. So, “costs” means: productivity, hiring, training, work, work signals, work standards, work sequence, machines, tooling, maintenance, queue time, set-up time, part-travel time, cycle time, lead-time, space, materials, consumables, inventories, taxes, warehouses, energy, abnormal conditions, demand, parts, waste, unevenness, unreasonableness, spirit, challenge, creativity, innovation, teamwork, learning, evolution… and a thousand more things. Bob, which book of Ohno’s are you quoting from? Besides that one, are there others he wrote which have English translations? I’m quoting from Toyota Production System. Also see Workplace Management and Just-In-Time for Today and Tomorrow. Some more of the great man’s (Taiichi Ohno) words. It is easy to remember theory with the mind; the problem is to remember with the body. The goal is to know and do instinctively. Having the spirit to endure the training is the first step on the road to winning. Many thanks to Norman Bodeck and Productivity Press. He founded the company and published the books from which these quotations are taken. Hi Sid – You’re darn right! A million thanks to Norman Bodek AND to the interpreter, Andrew Dillon. Great work by both guys.